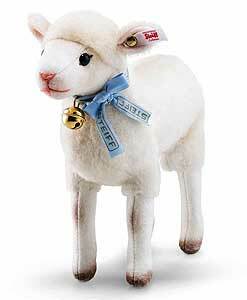 Lena Lamb by Steiff. This beautiful hand made piece, in white wool plush, wears the white ear tag, signifying this item as a Steiff limited edition, together with the famous gold plated Button in Ear. Limited edition of only 1000 pieces worldwide. Product details: non jointed, safety eyes, synthetic filling material, non growler, size 21cm. Comes boxed, together with a numbered certificate of authenticity. Ashby Bears proudly presents LENA LAMB Ever since 1892 the lamb has featured on the Steiff range, in many wonderful styles and designs. Sometimes a pincushion and sometimes on wheels. But always beautifully like. Our Lena Lamb is a joyous celebration of one of our designs dating way back to 1903. The expressive face is framed by wool plush. Like the original, Lena Lamb wears a printed neck strap in light blue with ‘Vintage‘ Steiff’ lettering. The brass bells are gold-plated just like the ’Button in Ear’. This lamb made of high quality wool plush and wool felt has a natural feel and has been designed with loving care.